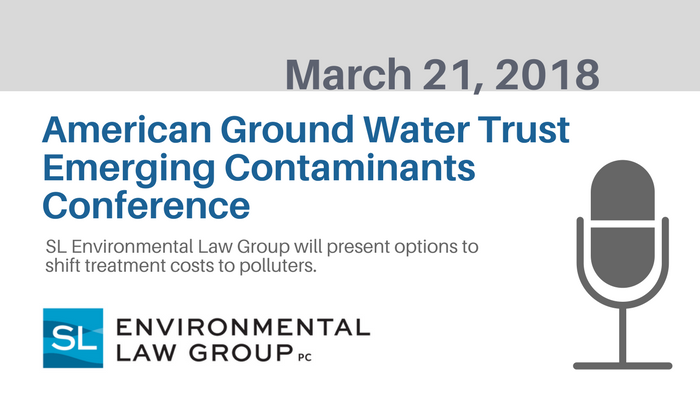 SL Environmental Law Groups Director of Client Engagement, Bill Kelly, will speak at the American Ground Water Trust Emerging Contaminants Conference on March 21, 2018. The day long education and information exchange will focus on Perflourochemicals (PFCS) and 1,2,3 Trichloropropane (1,2,3-TCP). Emerging contaminants such as the PFCS and 1,2,3-TCP represent challenges for dealing with legacy groundwater contamination. 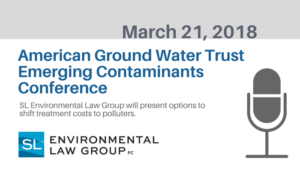 Water providers are faced with an urgent need to respond to concerns about health issues, property values, remediation options and infrastructure costs related to the occurrence of these compounds. States such as California, Hawaii and New Jersey (pending) have all set maximum contamination levels (MCL) for 1,2,3-TCP. New Jersey has pending regulatory changes that will give them the lowest MCL for PFCS in the United States. Bill Kelly will be speaking about holding the polluters accountable for ground water pollution. The California State Water Resources Control Board recently adopted regulations limiting the amount of 1,2,3-TCP in drinking water affection over 100 communities in the state. The Board’s regulations set the MCL for TCP at 5 parts per trillion (ppt) in recognition of the toxic effects of the synthetic chemical. As a result, community water systems, and non transient/non community water systems with elevated TCP will have to spend large sums of money to treat and mitigate water contamination. Bill will talk about the products liability strategy to recover treatment costs from polluters.